Spina, who came to write in Italian, was twelve years old in 1939, when Italy officially annexed Libya. By that time, Naffis-Sahely writes in The Nation, Italians already made up thirteen percent of the country’s population. 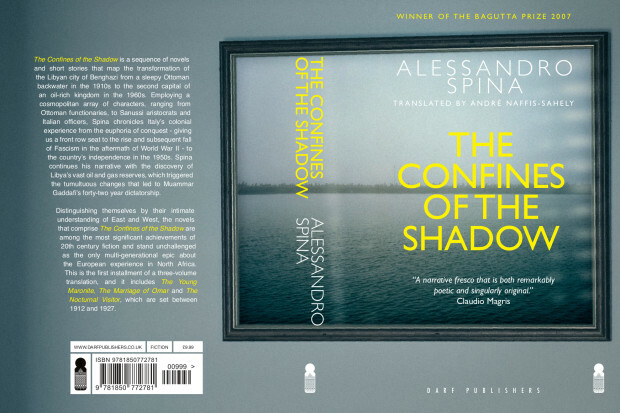 Spina’s initial instalments of The Confines of the Shadow attracted some notice in the mid-1970s, with several of them, including The Young Maronite, making the short-lists for the Strega and Campiello prizes, his presence in Libya began to grow increasingly tenuous, especially once his father’s factory was nationalized in 1978. The years following Gaddafi’s coup had seen the despot de-foreignize Libya, a process he began in 1970 with the expulsion of thousands of Jewish and Italian colonists. Thus, at the age of 50, Spina witnessed the Italo-Arab-Ottoman universe he’d been born into flit away into nothingness. This did not impair Spina’s writing, Naffis-Sahely writes, but “it certainly impacted its publication.” Spina fled Libya in 1980, and when he did, he was forced to smuggle out a manuscript in the French consul’s briefcase. After this, Spina retired to Padergnone, where he worked on completing The Confines of the Shadow. Alessandro Spina’s saga begins in November 1912 with The Young Maronite, which sees Italian soldiers solidifying their control over Libya’s coasts, leaving the Libyan rebels to withdraw to the desert and prepare for a war that would last until 1931, when by dint of sheer brutality, including the internment of tens of thousands of civilians into concentration camps, the Italians crushed the rebellion and murdered its widely respected leader, Omar al-Mukhtar. Employing a cosmopolitan array of characters, ranging from Ottoman functionaries, to Sanussi aristocrats and Italian officers, Spina chronicles Italy’s colonial experience from the euphoria of conquest – giving us a front row seat to the rise and subsequent fall of Fascism in the aftermath of World War II – to the country’s independence in the 1950s. Spina finally concludes his narrative with the discovery of Libya’s vast oil and gas reserves, which triggered the tumultuous changes that led to Muammar Gaddafi’s forty-two year dictatorship. Distinguishing themselves by their intimate understanding of East and West, the novels that comprise The Confines of the Shadow are among the most significant achievements of 20th century fiction and stand unchallenged as the only multi-generational epic about the European experience in North Africa. This is the first instalment of a three-volume translation, and it includes The Young Maronite, The Marriage of Omar andThe Nocturnal Visitor, which are set between 1912 and 1927. The Confines of the Shadow was awarded Italy’s Premio Bagutta in 2007 and the Premio Cavallini in 2011. In order to bring it into English, London’s Darf Publishing house is trying to raise £8,000 to underwrite production costs of the 1300-page work. The first volume is set to arrive in January 2015. A £10 donation will get you an advance copy. Seth Rogan Called Barbra Streisand “an Old Jewish Lady!